It might be a ‘trend’ thing right now but Positive Birth Affirmations are being, and have been, used for many many year, births and in different cultures. These affirmations are said and read, and help a woman in labor to mentally and physically prepare to and birth their baby. The aim is to support the labouring Mothers body and ability to give birth with positive words, phrases, thoughts and therefore beliefs. They also help to support the birth-partner in supporting the labouring Mother, and to help encourage their roles as new parents. Personally I like the idea of them and actually started my labor with an affirmation to myself in the bathroom mirror right after my waters had broken. However, they went out the window from that point. But if these are something you’d like to use, I have made some graphics below for you to save and either print and stick up around your home, or save and use as a wallpaper on your phone - see below for my thoughts on each affirmation with Mia’s birth in mind. She believed she could, so she did | to me this is more of a small biz type boss term seen on instagram or Pinterest more than in birth. Women all over the world are birthing with me | THIS, this is what I thought about throughout my pregnancy, labour and delivery. I used to live in India and often thought about women in slums, giving birth with no medical support. If they can do it, then I flipping can. Hold the vision, Trust the process | I didn’t hold any vision but I did 110% trusted in my body and my baby. I knew and fully believed my body knew what it was doing and I just had to go with it. I look forward to embracing this empowering experience | I still struggle with this one. Yes, I am still in shock that I birthed my baby in a natural way. Ingimar said I was his Wonder Woman - that’s pretty empowering. I am a strong and capable mother | Well, I had no idea what kind of Mother I’d be but I could only hope for this one. I am a strong, capable and stubborn wife and had managed 9, almost 10 months of pregnancy pretty well. My baby will be born when she is ready | Absolutely, and this was what I kept in my mind as the midwife and hospital were starting to discuss induction - I knew we weren’t headed for that and baby would be fine coming in her own time. I deserve the birth I desire | Hmm, I didn’t really have a birth I desired as such. I wanted a safe delivery, a happy and healthy baby so yes, I desired a safe birth but was open to medical advice where required. I am strong, confident, assured, and assertive | I sure am all of these things BUT put me naked in a birthing pool with my husband and a complete stranger speaking to him in another language and I might loose some of that confidence and strength. I was self assured thought Ingimar did a great job, as did the midwifes, but I was so in the zone that I have no idea what anyone else said to me. My baby knows the exact right moment to be born | Again, I trusted fully in my body and my baby so this one is true. I trust in my ability to birth | Yup!! It’s all natural and woman have been doing this for generations. My Mum did it, her Mum did it and so on - I sure as heck could do it too. I am completely relaxed | Surprisingly I was and it was because I kept telling myself or rather reassuring myself that I was. I do think that we have a very powerful mind and we can easily manipulate how we feel. So in labor we can easily be worried, stressed and so on OR we can choose to relax and trust our bodies. I did this. I told myself to relax, to listen to my body and baby, to breathe and to stay calm and present. I let go and give in | Having said all the positives above, I did get to a point where I turned to Ingimar and said that I couldn’t do it. I only said that once and then the midwife told me I was 10cm and it was time to push. It was hard to let go and give in - I never really felt to urge to push so as much as I was trusting in my body, I found it hard to give in to the contractions and let my body take over - though I certainly didn’t fight it. Everything is going to be ok | and it is. Whatever happens, your baby will be delivered. My birth will be a joyous birth | This is actually hard for me still as my pregnancy and labor were fine but my delivery was bl**dy hard work and left me in a bad way. I had tears and an episiotomy to heal (which I later had a repair surgery on). I’d love to say it was a joyful birth but the truth is that I was in shock, I was sore, I could feel myself tearing, I could feel some of the stitches. It felt more like a surgery than how I had imagined birth to be. I struggled to sit, to get up, to nurse my baby. I was a mess and fought very hard to ignore all of that and enjoy those precious first moments. I am not alone. 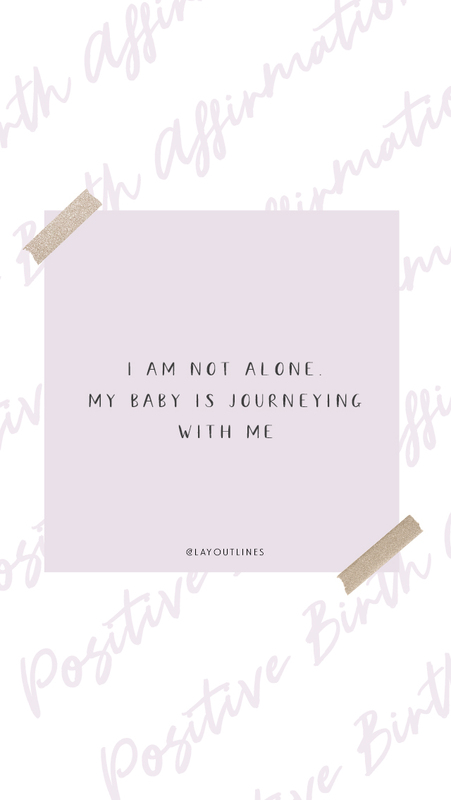 My baby is journeying with me | I think if I had put to my mind to it then this would have been true but I felt less connected to my baby once my waters had broken. I’m not sure if this was because she was on the way out and so the idea of ‘bump’ revealing herself as Mia was difficult to imagine. I felt like they were almost separate entities and it was hard to imagine her making her way down the birth canal but no she or I were ever alone. My birth was about my baby coming out into the world. Ingimar helped make me feel as comfortable as he could, I did what I could to help progress in my labor and safely deliver our baby but it was about Mia. The power and intensity of my contractions cannot be stronger than me, because it is me | True but a little airy for me. I don’t think I had or have a clue about what my body is truly capable of, in a positive and negative way. I had no idea how strong my contractions could get and how much pain I could handle - and thank goodness for Gas and Air, I still don’t. Which POSITIVE BIRTH AFFIRMATIONS did you like, have used?